Dedicated Work Spaces Help You Focus and #GSD. "Ghost Browser allows you to log into any web site with multiple accounts from one window. This can be very handy when you manage multiple social media profiles for each of the social media platforms." "Since the Internet is your office, you need a tool that helps you get things done online. Ghost Browser is designed to simplify your browsing experience, keep you organized and boost your productivity." "There are extensions to sign into multiple accounts, but Ghost is a much better solution than any of these. Plus, Ghost is built on Chromium so it works with all the Google Chrome extensions you already love." Color-coded sessions have separate cookie jars so you can log into multiple accounts at once. Assign a different proxy to each tab or to groups of tabs in a flexible and powerful way. Built on Chromium so you can import your Chrome extensions in under 30 seconds. Save your tabs into groups and pull up only the ones you are using right now! Instant productivity! Spend sixty seconds now to learn how to save hours every week. Install Ghost and import your Chrome settings and extensions in under 2 minutes. Works on Window and macOS. Linux is on the roadmap. Backed by the Chromium open source developers around the world. Our entire team participates in supporting our clients. Be in touch! 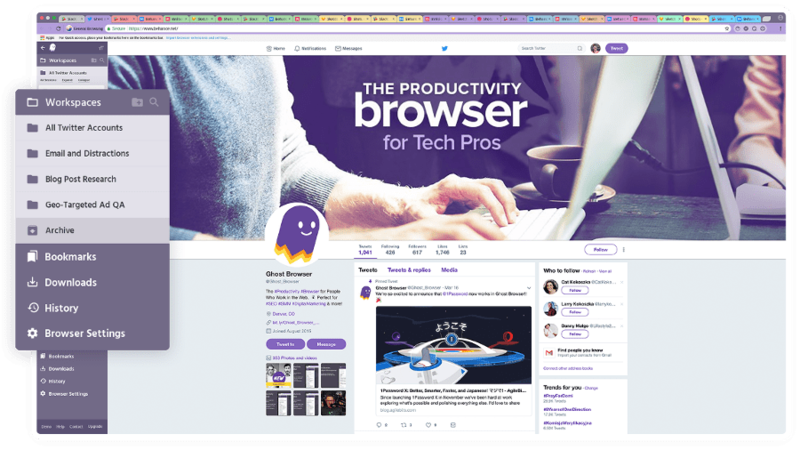 See how other companies that do social media management, customer support, web development and QA are using Ghost Browser every day to boost their teams' productivity. You can download and import all of your Chrome extensions in a matter of minutes. Switching browsers has never been easier. © 2018 Ghost Browser, All Rights Reserved.